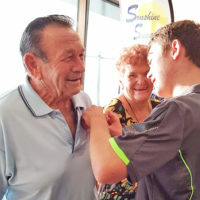 Yamba Bowling Club hosted the CRDWBA Mixed Pairs finals last week and with the hot weather leading up to the finals it was a pleasure for the players to be able to bowl in cooler conditions. The format for mixed pairs 2 x 5 ends. First the semi-finals were played and Joan Scadden, Graham Meany dCarol & Bruce Caldwell; Judy Parkes, Steve Jackson dToni Shorten, Jason Ryan. Judy Parks, Steve Jackson v Joan Scadden, Graham Meany played in the final. You would have paid money to watch this game of bowls with 2 sets of 5 ends the result 1 set to each team. It came down to a one end tie break with the last bowl deciding the winners. Wow what a game. 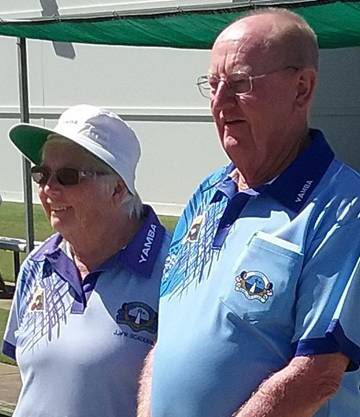 Congratulations to Joan and Graham both members of Yamba BC. And we believe the winners have been runners up the last 2 years.